Designed by architect Joshua Woodsman of Pin-Up Houses, this bright pink tiny home is one of the most vibrant we’ve ever seen. 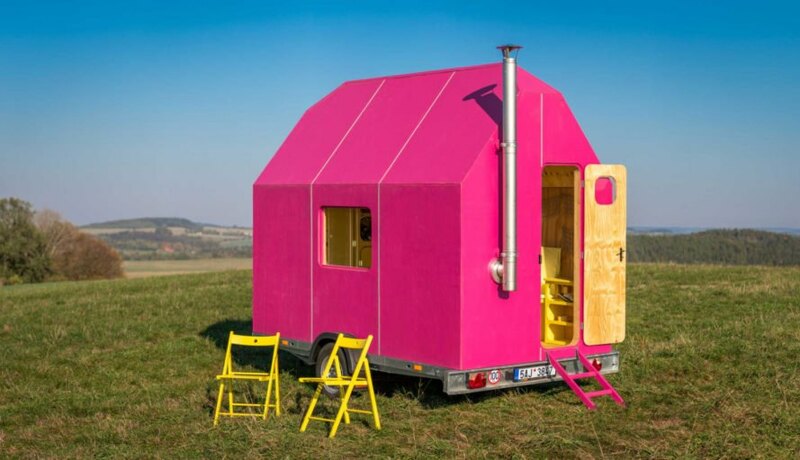 Adding to its whimsical exterior, Magenta is a prefabricated tiny home on wheels that has a living space of just 66 square feet. However, within that tiny space are plenty of creature comforts that make it a fabulous home for living life on the road. 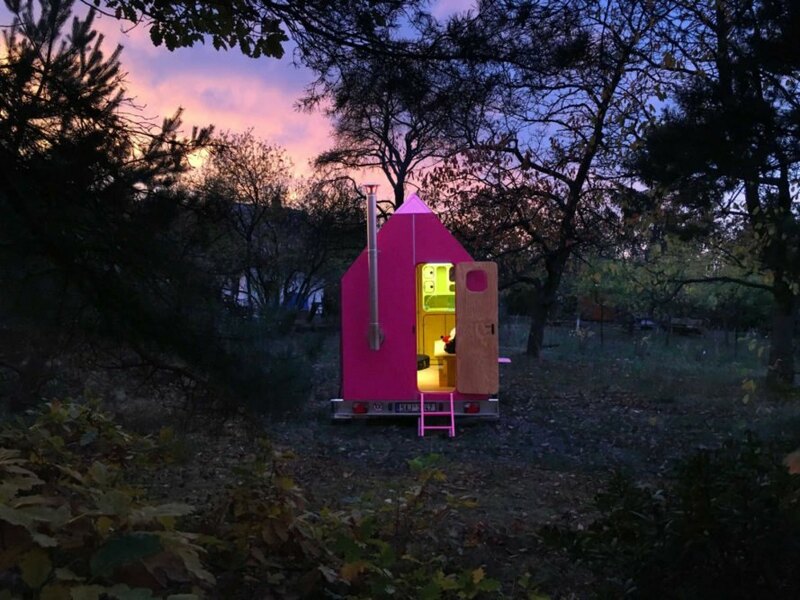 According to the team from Pin-Up Houses, the vibrant Magenta is “a manifesto of temporary independent housing, against debt and mortgages.” Built on a flat trailer, the tiny home was designed for people who want to live on the road with a transportable but comfortable home. Accordingly, Magenta was built with extremely lightweight materials, waterproof plywood and spruce beams. Polystyrene insulation was installed on every side of the home, keeping it cozy and warm in the winter months and cool in summertime. A large window lets natural light into the living space. The interior space is compact, but the designers were able to outfit it with almost all of the basic amenities. There is a comfy sofa bed along with a small kitchenette that has a water tank, a gas cooker, a sink and plenty of secure drawers. A dining table with two chairs offers a nice place to eat and work. When nature calls, a humble chemical toilet was installed in a tiny water closet. Additionally, there is a heating stove that keeps the place nice and toasty. The home was built with a pitched roof, which gives the interior extra space for storage. Besides the custom built-in furniture, such as pull-out drawers under the sofa, there are multiple stretched nets hung on the walls for stashing away personal items. There is also a larger net that spans the length of the ceiling, adding a ton of space for storing sporting equipment, clothing, books and more. 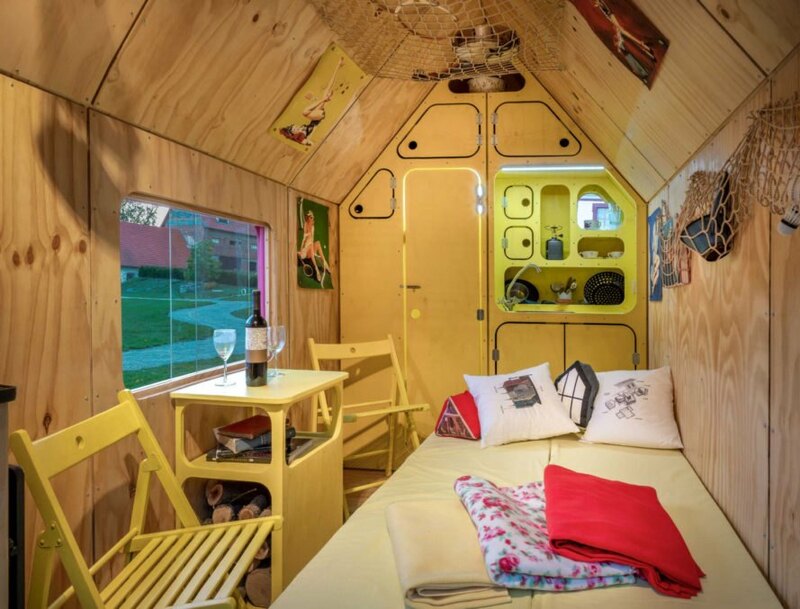 The Magenta Tiny House was designed by the team from Pin-Up Houses. The fun magenta color adds a whimsical touch to the design. 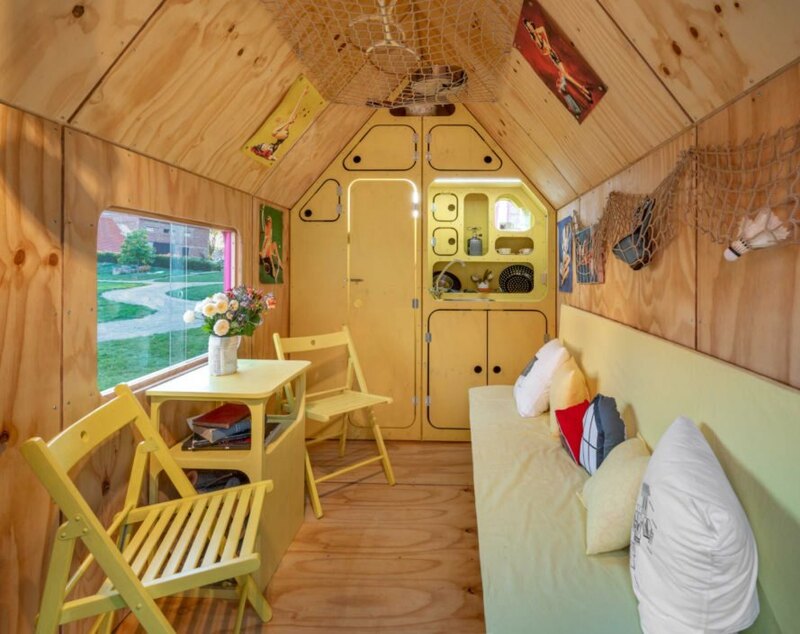 The tiny home was designed for those looking to live free from a mortgage. 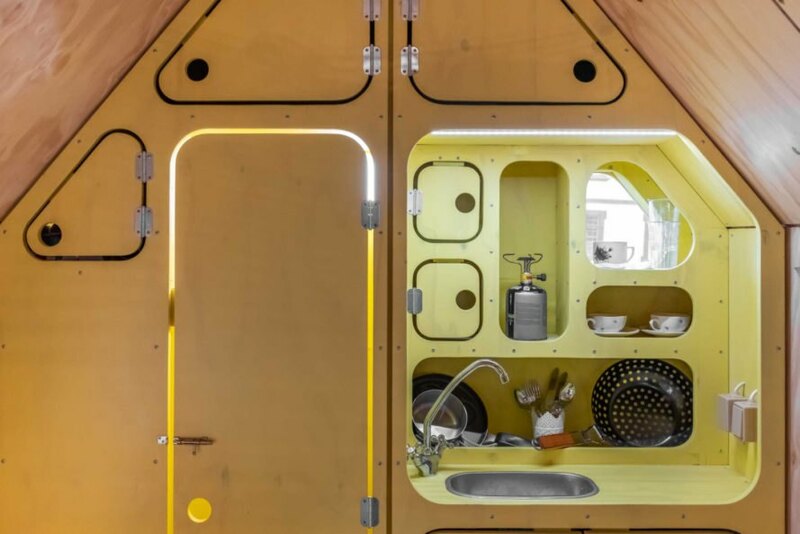 The 66-square-foot interior has all of the basic amenities. A small sofa pulls out into a bed quickly and easily. Nets are hung around the space for extra storage. The kitchenette houses a small countertop, a sink and plenty of storage. Strategic storage was custom built into the furniture. The vibrant pink exterior makes the home stand out on the road. The Magenta features an extremely lightweight design. 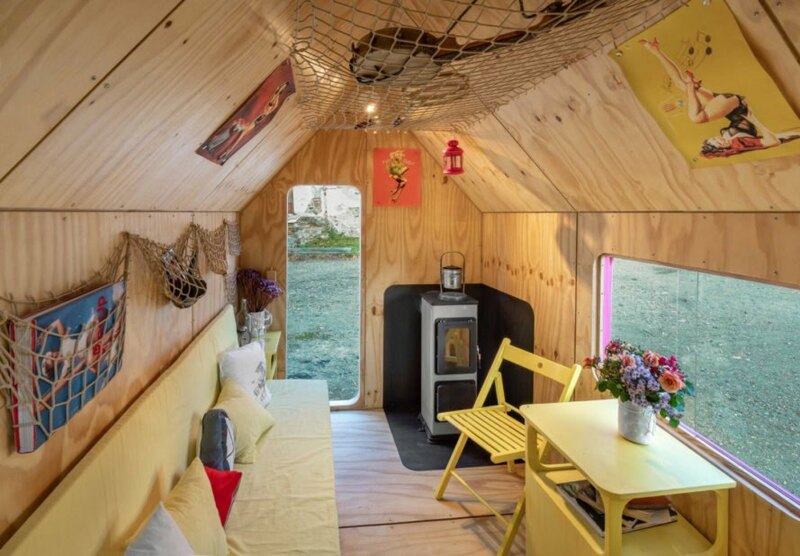 The tiny home is well-insulated to provide a cozy interior all year long. The designers offer the building plans on their site. The home is perfect to take on the road.